The Cloud Firestore data viewer in the console is a great place to view and update data. You can watch in real time as documents and fields update. 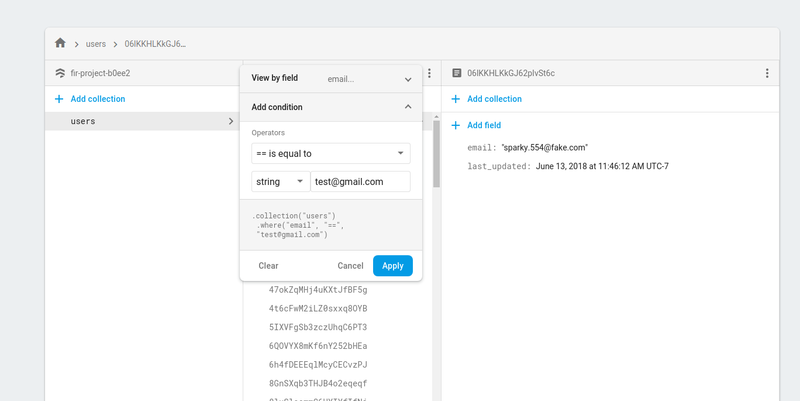 We all know that Cloud Firestore scales to huge amounts of data automatically — but what about the data viewer? Until now, it was hard to navigate through a big dataset. To solve the problem, we added a new feature that lets you order and filter right in the data viewer. Sorting by a field. Let’s say you have a field last_updated on all of your documents in a collection users, and you want to see the documents that were updated most recently. Just open the menu, choose the field last_updated, select Descending and click apply. Finding a specific document. Perhaps you have a collection of users which has the fields email and last_updated, and someone tells you they are having a problem with their account. Using the filter menu, input the field email and add a condition (email == "test@gmail.com") to instantly find that user’s document. These are just a few ways that you can use the new menu. We hope it helps you browse large datasets with ease.